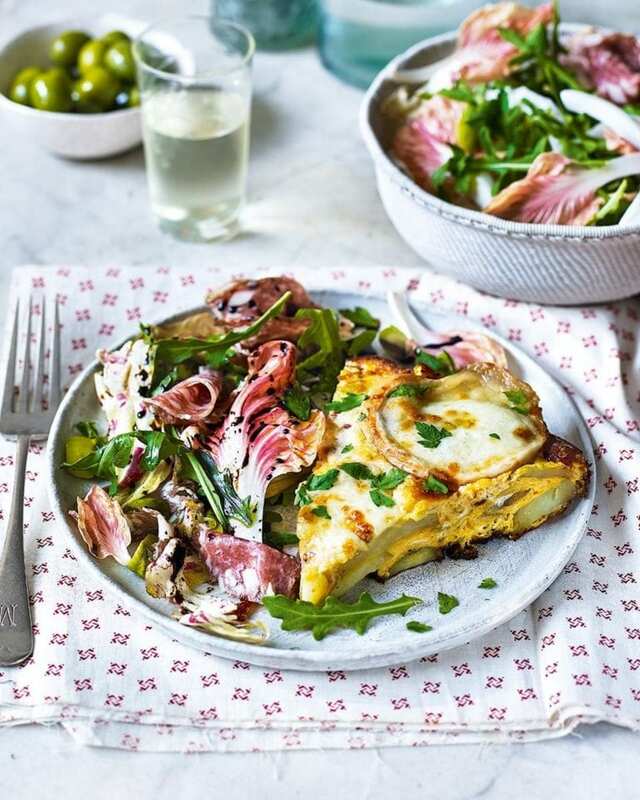 This cheese and potato frittata makes a fabulous lunch served with the radicchio salad. And it’s just as good cold the next day, so you can pop it in a tupperware to enjoy on-the-go. Cook the sliced potatoes in a large pan of salted boiling water for 1-2 minutes, then drain and leave to steam dry briefly in the pan. Heat the olive oil in the frying pan over a medium heat, add the potatoes and cook for 5 minutes, turning once. Add the shallots and cook for 5 minutes more, stirring every now and then, until both are soft and golden. Add the garlic and cook for a minute. Heat the grill to medium. In a large jug, whisk the eggs with the milk, parsley, 50g of the grana padano cheese and plenty of salt and pepper. Add to the pan with the potatoes, shallots and garlic, then nestle the mozzarella slices in the mixture. Cook over a low-medium heat for 6-8 minutes until golden underneath and set halfway through. Sprinkle with the remaining grana padano. until golden on top and just set. Leave the frittata to cool slightly while you make the salad. In a large bowl, toss together the radicchio, rocket, salami and olives. In a small bowl whisk the balsamic vinegar with the olive oil, lemon juice and a little salt and pepper. Toss the dressing with the salad, then scatter with shavings of grana padano. Serve with the frittata, cut into slices. The frittata will keep for 3 days, covered, in the fridge. It makes a great lunchbox filler.